I’m trying to mentally will it to stay warm by only posting and cooking spring and summer recipes. Depending on where you live, this strategy may or may not be working for you, but it appears (at least so far) to be working here in Denver. My sphere of influence is only so big after all. But, when the weather does finally break where you are, or if you just say, “Screw it” and grill in the snow, these spicy and sweet chicken kabobs need to be on your list. Maybe they won’t be the first thing that touches your grill grates (we already discussed the joys of spiral hot dogs), but they should be top five. Vegetarian? No worries. 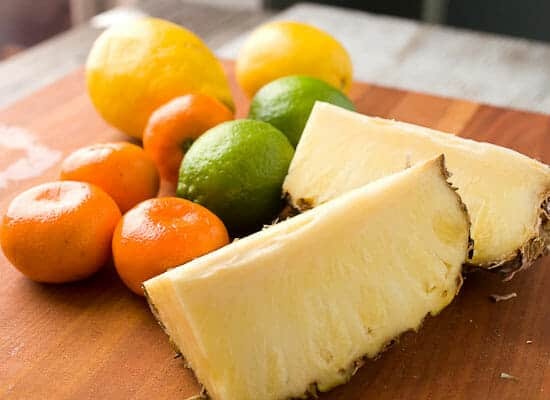 Toss some tofu or tempeh in the same maple marinade and skewer it with the same bright citrus flavors. Good eats. 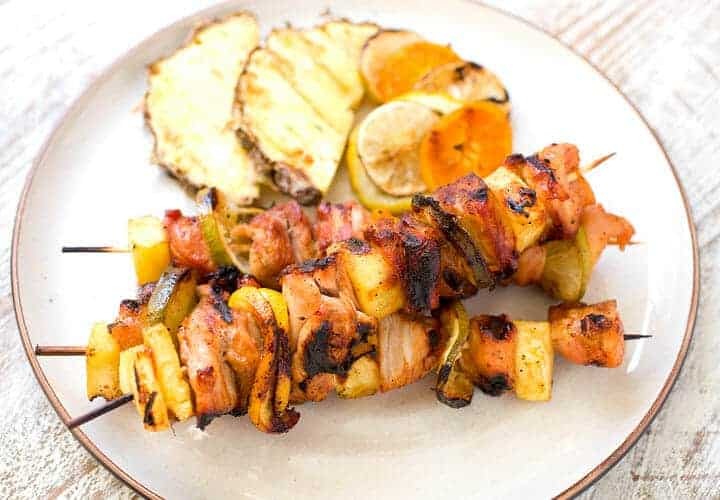 If you’re having a casual BBQ, you can just serve these spicy maple citrus chicken kabobs on the skewer or you could make a full meal out of them with rice or flatbreads. These are the perfect kabobs for a chill weekend BBQ. 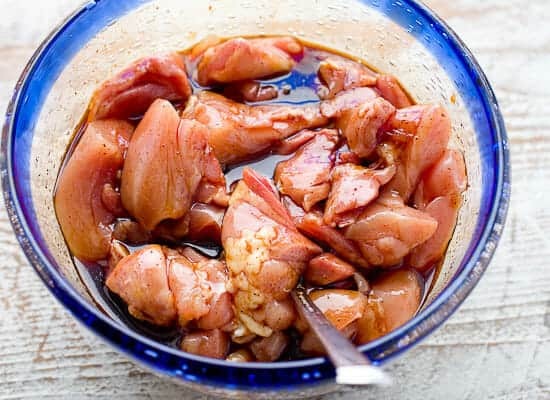 Marinate the chicken in a sweet and spicy maple marinade. 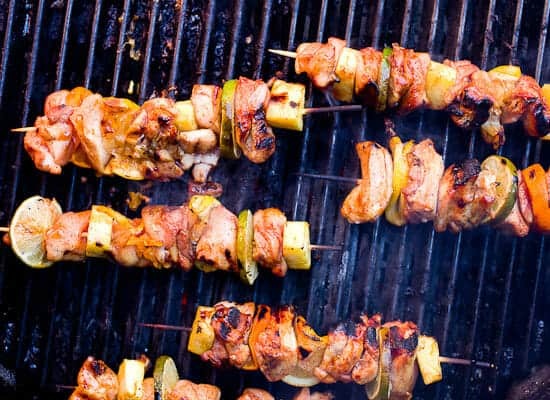 If you’re using wooden skewers, soak them in advance for a few hours so they don’t get too burned on the grill. 1) In a small pot, combine syrup, soy, and orange juice over low heat. Stir in cayenne pepper and bring to a simmer. Simmer for 4-5 minutes until mixture thickens a bit. Then remove from heat and let cool to room temperature. 2) Cube chicken (I like a mix of breasts and thighs) into about 1-inch cubes. Add chicken and maple marinade to a large bag or bowl and coat well. Let marinate for at least 30 minutes, but you could make it a day in advance. 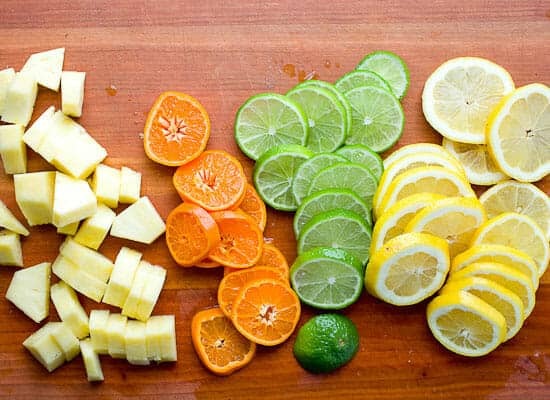 3) Slice citrus into thin slices or chunks for the pineapples. 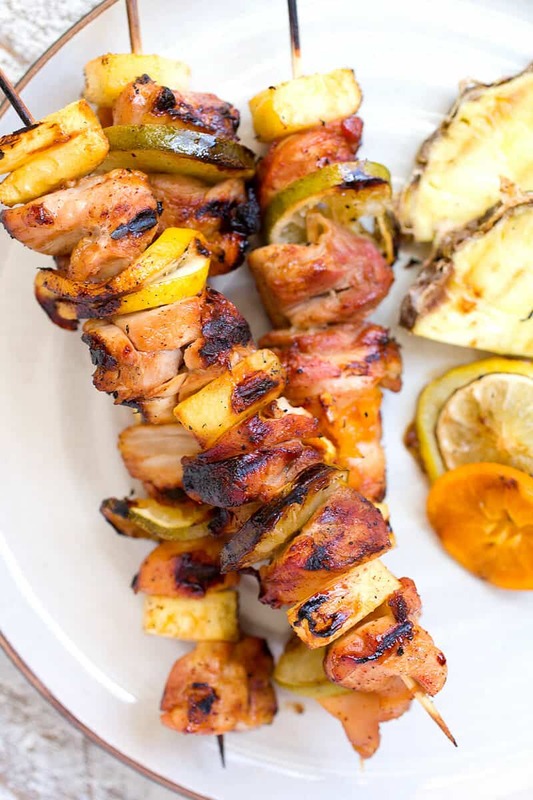 4) Make skewers by alternating chicken with citrus pieces. You should get approximately 10 skewers from the ingredients. Preheat grill to medium-high heat if you’re using gas grill. 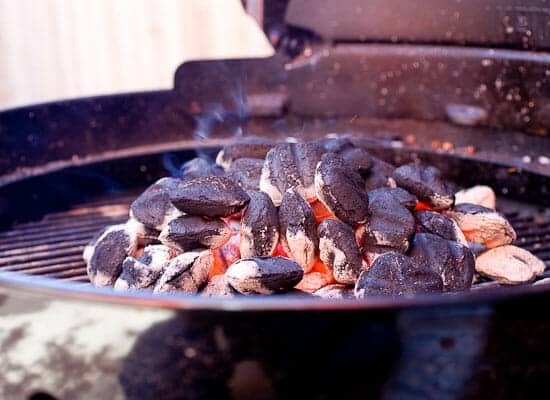 For a charcoal grill, build a big mound of coals and have an area for direct heat and indirect heat. 5) Before grilling, rub the grill grates with some neutral oil on a paper towel (use tongs so you don’t burn your hands). Then grill the kabobs over direct heat for a few minutes to get some charring. Transfer to indirect heat and continue to cook for 8-10 minutes until chicken is cooked through. Keep an eye on the kabobs as they grill and rotate them as needed to ensure even cooking. Some charring is good. Serve kabobs while warm by themselves or with rice or flatbreads for a full meal. I love grilling citrus. It concentrates the flavors and the acid really helps dishes like this. Speaking of grilled citrus, that just reminded me of grilled sangria (now I’m thirsty). Anyway, you could pretty much use any and all citrus for these guys, but I kept it fairly simple with some limes, lemons, big chunks of fresh pineapple, and few little oranges. I like those little Cutie oranges that come in big bags that you can never finish. You know the ones. Slice all the fruit up into wedges or coins and they are skewer-ready. This is such an awesome chicken marinade with really just a few ingredients. 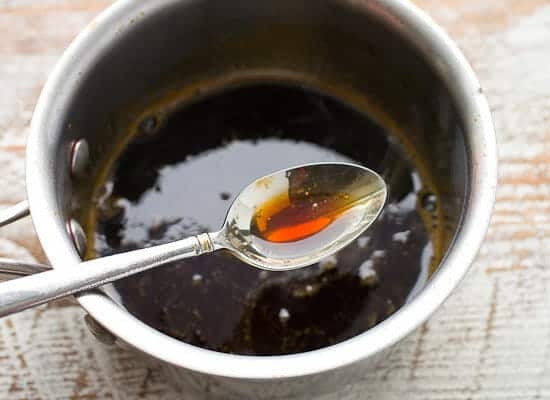 Combine the maple syrup, soy sauce, cayenne pepper, and orange juice in a small pot and let it simmer over low heat for a few minutes until it thickens a bit. It should coat a spoon. Then let it cool to room temperature and toss it with your chicken. I like to use a mix of breast and thigh meat for my kabobs. Obviously, try to cube the chicken into even-sized pieces, but don’t obsess over it. 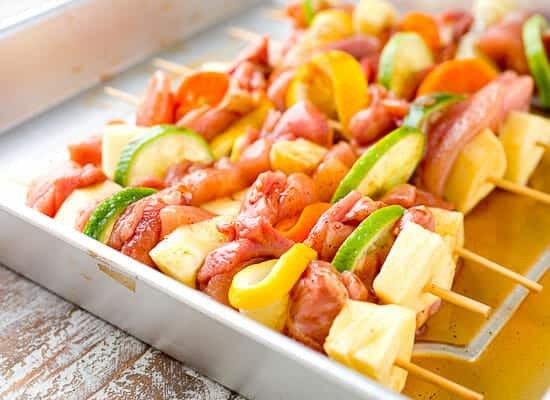 After the chicken has marinated for at least 30 minutes (or make it in advance), just make the skewers by alternating chicken with the fruit. I pretty much arrange them randomly, but like to start with a pineapple piece on the bottom. It keeps the skewer secure. SKEWER NOTE: If you’re using bamboo skewers, be sure to soak them in water before you make the kabobs so they don’t completely burn. You can cook these over a gas or charcoal grill. If you have the time and ability, charcoal is preferred in my opinion. I like it because I can get a good char on the kabobs and then transfer them to a more indirect heat area to slowly cook. Plus, I get to take cool photos like this. Before you stick these skewers on the hot grill, do yourself a favor and rub your grates with a little neutral oil on a paper towel. Use tongs to make sure you don’t burn yourself. If you skip this, the syrup in the marinade might stick to the grates really badly. It still might stick a bit, but it won’t be nearly as bad if you oil them well. Cook the kabobs over high heat first to get some char and then transfer them to a cooler section of the grill to finish cooking. All-in-all, they should need about 15 minutes to cook through. It’s always a good idea to test a piece of chicken from a center section of the kabob. These kabobs end up being bright and flavorful with just enough spicy and sweet flavors to make you grab another skewer before they are all gone. Go forward and grill, team! They look really good! I think I will try them this week, what an easy weeknight dinner. Here’s a chance for me to share my grilling tip. I have found it is really easy to fill a wine bottle with water and drop the skewers in, cork it and soak them. They fit just right and don’t take up so much room on the counter. If there is a little wine left in the bottom of the bottle it will just add more flavor! Have a nice day!! That’s an awesome tip! Thanks Karen! I love shrimp and pineapple on the grilll. If I did these with shrimp rather than chicken, should I cook the shrimp separately so the other things can cook longer? This recipe sounds like it would work really well with that combo. Any tips on that? I know you shouldn’t let it marinate as long, maybe 15 mins. Love your real world style blog and recipes! Hey Dawn, yea… shrimp cook SO fast, but the other stuff on the skewers (fruit) doesn’t really need to be cooked. I think they would lose a lot of flavor if you cooked them separately so I would keep them on one skewer. I would just take them off when the shrimp were done cooking. :) Good luck!